Water covers 71 percent of Earth’s surface, giving rise to the nickname “the Blue Marble” or “the Blue Planet.” Satellites that observe ocean color, however, show that it’s not that simple. Materials in the water—living or otherwise—are often stirred and mixed until the surface swirls with hints of blue, green, tan, white, and brown. In the image, the brown area along China’s Subei Shoal is turbid water commonly seen in coastal regions. According to Wang, shallow water depths, tidal currents, and strong winter winds likely contributed to the mixing of sediment through the water. Some of the swirls in the image might be due to the Yellow Sea Warm Current, which intrudes into the Yellow Sea in wintertime. 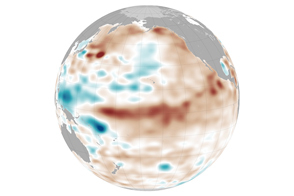 This branch of the Kuroshio Current changes the temperature of the sea surface and brings instability that could be the cause of the relatively dark swirls in the lower-middle part of the image. 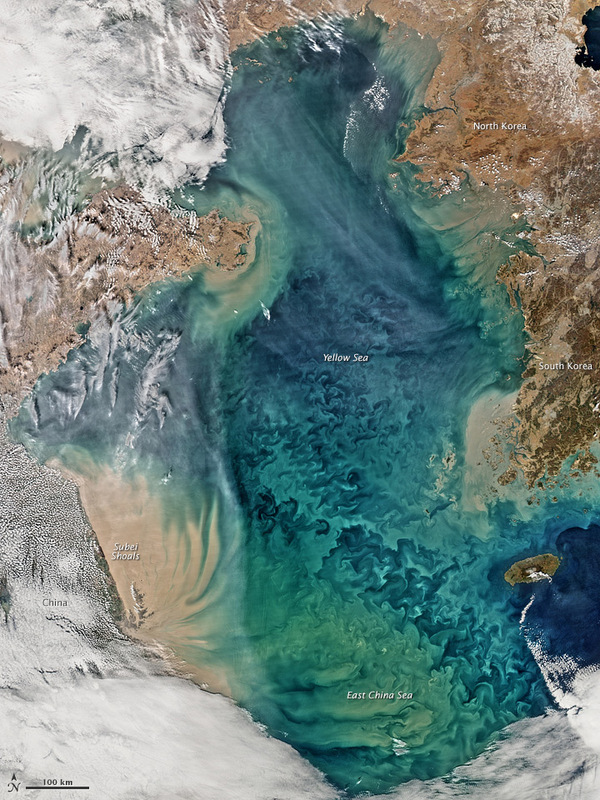 Interpreting satellite images of ocean color can be a challenge, especially in complex regions like the Yellow Sea. Upcoming missions such as the Pre-Aerosol, Clouds, and ocean Ecosystem (PACE) should help scientists to better distinguish the particles and materials in the atmosphere and ocean. NASA images by Norman Kuring, NASA’s Ocean Color web. Caption by Kathryn Hansen. 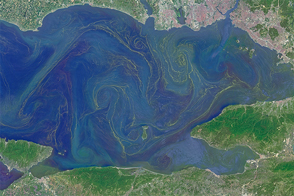 The Yellow Sea has some of the most turbid and dynamic waters in the world. Hickox, R. et al. (2000, September 15) Climatology and seasonal variability of ocean fronts in the east China, Yellow and Bohai Seas from satellite SST data. Geophysical Research Letters, 27 (18), 2945-2948. Riedlinger, S. K. and Jacobs, G.A. (2000, December 15) Study of the dynamic of wind-driven transports into the Yellow Sea during winter. Journal of Geophysical Research: Oceans, 105 (C12), 28,695-28,708. Shi, W. and Wang, M. (2010) Characterization of global ocean turbidity from Moderate Resolution Imaging Spectroradiometer ocean color observations. Journal of Geophysical Research: Oceans, 115 (C11). 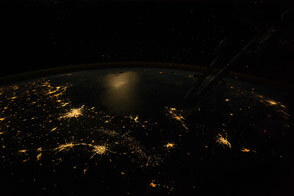 Shi, W. and Wang, M. (2012) Satellite views of the Bohai Sea, Yellow Sea, and East China Sea. Progress in Oceanography, 104 (October 2012), 30-45. Teague, W. J. and Jacobs, G. A. 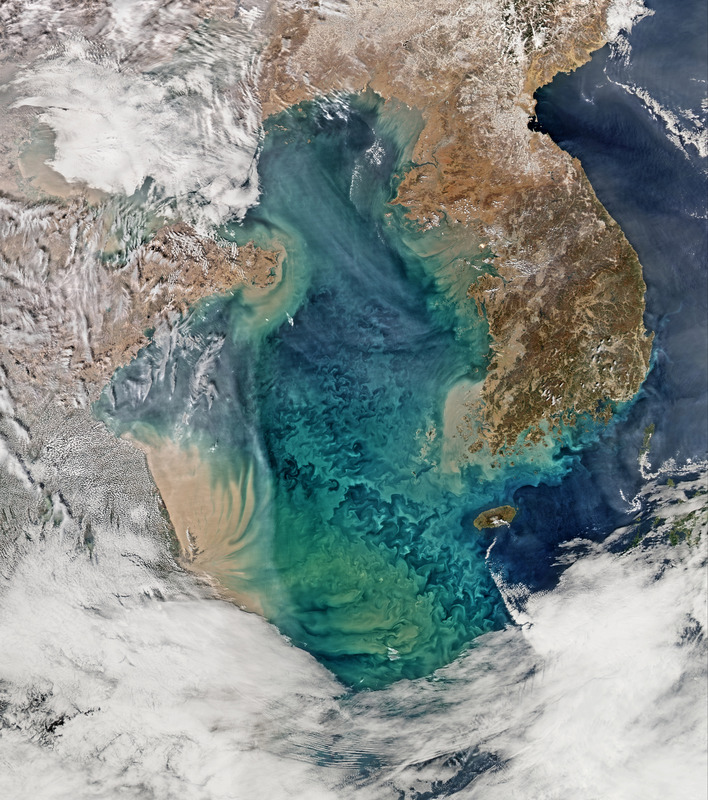 (2000, February 15) Current observations on the development of the Yellow Sea Warm Current. Journal of Geophysical Research: Oceans, 105 (C2), 3401-3411. Yuan, D. et al. (2005, October) Cross-shelf penetrating fronts off the southeast coast of China observed by MODIS. Geophysical Research Letters, 32 (19).